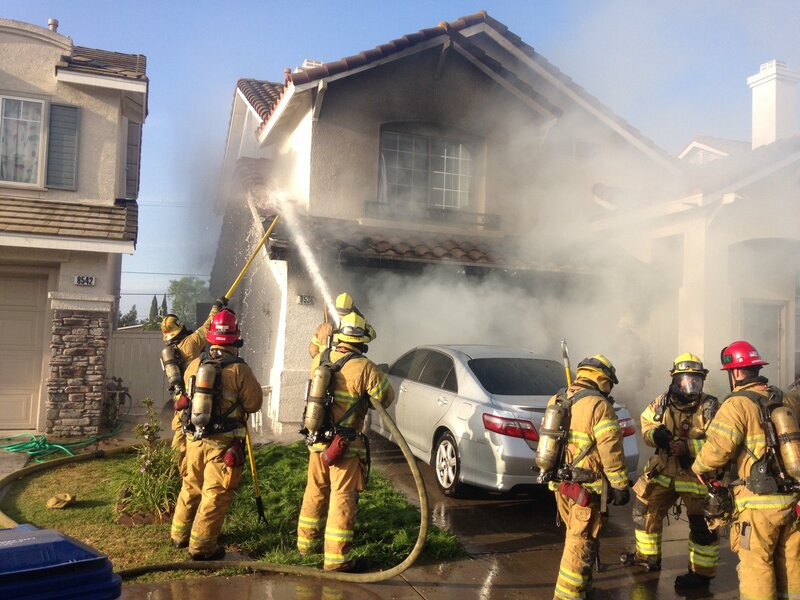 ORANGE COUNTY Fire Authority firefighters battle a blaze in Westminster in May 2017 (OCFA photo). After several hours of presentations, discussion and debate, the Garden Grove City Council voted Tuesday night to replace the Garden Grove Fire Department with a 10-year contract with the Orange County Fire Authority, effective in August. Voting in favor were Mayor Steve Jones and Councilmembers John O’Neill, Phat Bui, Stephanie Klopfenstein and Kim Nguyen. Voting against was George Brietigam, while Thu Ha Nguyen abstained. The GGFD was established in 1926 as the Garden Grove Fire Protection District. It became the fire department when the city was incorporated in 1956. The council’s decision came after more than a year of hearings, budget analysis and lobbying by the Garden Grove Firefighters’ Association Local 2005. Under the contract, all GGFD sworn personnel and several non-sworn personnel will be taken into employment by the OCFA, which is based in Irvine and which serves 23 cities – soon to be 24 – as well as unincorporated communities. It has 71 fire stations; Garden Grove will add six more. In the end, the concept of better service carried the day over increased costs. The city’s financial study indicated that the switch to the OCFA would add between $12.4 million and $13.3 million extra in expenses over a 10-year period. But backers of the contract argued that going to the OCFA – with additional paramedic staffing – would improve response times and potentially save lives. Discussion between council members and between the council and speakers sometimes grew rancorous. Exchanges between Brietigam and Eric Thorson, spokesman for the GGFA were heated and part of the in-council debate revolved around Cadillacs and Chevrolets. Based on their comments, it appeared that council members would split 4-3 in favor of the OCFA contract. But Mayor Steve Jones’s remarks may have altered the math, as he told the council and audience that the OCFA deal “was never about money” but about improving firefighting and medical services. After that Kim Nguyen decided to cast to a “yes” vote and Thu-Ha Nguyen abstained. When the motion to approve passed, firefighters who lined the walls of the council chambers waiting for the outcome erupted in cheers and applause. Also on Tuesday night, the council honored retiring Chief of Police Todd Elgin for his 32 years of service to the city. Additionally, the council approved the use of $340,000 in grant funding for a “Garden Grove Downtown Active Downtown Plan” and awarded a contract for its development and coordination to KOA Corporation. The next council meeting is scheduled for Tuesday, April 23 at 5:30 p.m.
Point of reference..the city of Garden Grove will add 7 fire stations to the OCFA. Every station in Garden Grove will be staffed by the OCFA. No raises sense 2008! Measure O was pushed by your police department by the way! Why don’t you learn the facts. The Fire Department already responds into Orange County on a daily basis as they respond into GG. It is better service and your city only has to pay 200,000 a year. Measure O aloud 3.8 million a year. It’s actually a deal for your city to go. I never understand why people get mad about paying taxes for fire service! I pay them for my city! You actually have someone at your house in under 8 mins for anything you call for! Pretty could insurance company if you ask me! A truly sad day for garden grove. What the taxpayers don’t know is that the garden grove fire Union has created such a toxic political environment that the city council is willing to throw the taxpayers under the bus just to be rid of these people. Of course the union erupted in applause, they are looking forward to massive pay raises that will allow them to buy additional vacation homes and more boats, rv’s and other assorted toys. Moving to OCFA will not improve service. Just ask Santa Ana. They will only add cost and longer response times. Just ask Metro Cities Fire authority members how much they like having OCFA as a neighbor…adding another paramedic to an apparatus will do absolutely nothing to improve response times. The fire unions insist on having two medics on board but that is to ensure they are stacking more and more dues paying union members on each apparatus. It has nothing to do with improving response times or quality of care. Each one of those council members who voted for this terrible contract will live long enough to regret it. Especially when OCFA union 3631 starts interfering in local elections – it’s only a matter of time before the union starts supporting and funding their preferred candidates who will continue to push for even larger, unsustainable compensation packages. Good luck, garden grove. You’re going to need it. Another point of reference. The city’s estimated cost increase over the 10-year contract is 2.4-15 million. The 15 million dollar estimate is based on the current contract between the city and the Garden Grove Firefighters L2005 which expires in June of 2018. It is not logical to assume 10 years with no contractural adjustments. The 2.4 million dollar number is based on a 1-time 5% across the board salary adjustment immediately. That is more realistic and thus why it makes fiscal sense to contract with OCFA and acquire all that agency has to offer for just over 200k more per year. It should be noted that currently Garden Grove firefighters are just over 7% behind 5th of 12 Fire agencies in Orange County. As the 5th largest city in OC we have always thought being paid 5th was appropriate. Costs aside this is an excellent opportunity for the City and the residents to be provided service by the OCFA. An immediate increase on 4 paramedics on duty daily and all engines and truck company’s being staffed with 4 personnel. The efficiency of 4 vs 3 on each piece of apparatus is immeasurable and will deliver the best possible initial response to all emergency’s. This will do nothing but cause fire and EMS services to skyrocket for taxpayers. This is a rotten deal for the community and has nothing to do with improving service and everything to do with greedy union goons fleecing the taxpayer for even more resources. Just ask Santa Ana what a huge mistake they made. Unfortunately Blair, your disdain for firefighters and our compensation package is palpable. I have been a firefighter/paramedic for 31 years and I hardly consider myself or my colleagues ‘union goons’..that being said it appears your hatred toward my profession is going to keep you from actually viewing this from a factual perspective. I do work closely with many OCFA units that are in Santa Ana and I can tell you from personal experience the City of Santa Ana is very happy with the move and won’t be looking back. The Garden Grove City Council made the right decision at the right time and for the right reason. Sorry for the typos in the above post. The contract between the city and the Garden Grove Firefighters expired in June of 2018. And upon the transition scheduled for August 16, 2019 the number of paramedics on duty will go from 10 to 14 on day 1.